During the first few weeks of a new year, my practice has long been Getting Things Organized (or Reorganized). This past month has fit perfectly into that pattern, and by now a number of tasks which have awaited my attention are crossed off the list in this year’s work plan. Satisfying indeed. A couple of caveats — these photos are all process images, taken while the work is on the loom, so the pieces are all under tension and therefore devoid of textural interest. That will show up nicely after washing and drying. 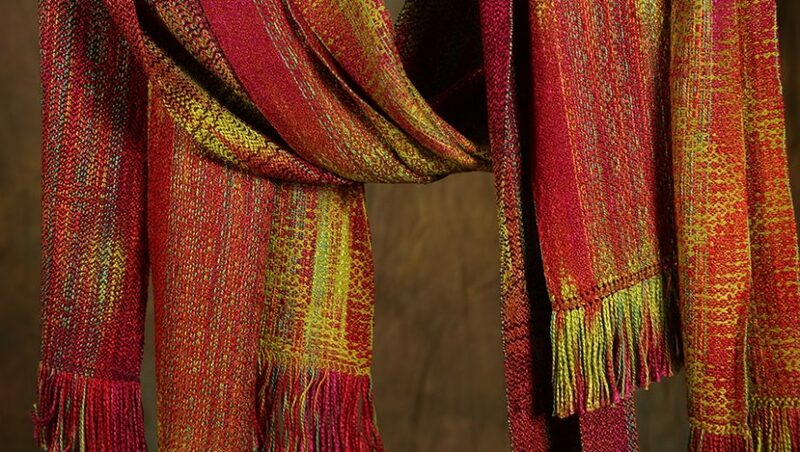 Second, some of the patterns are difficult to see well, due to the low contrast between the warp and weft colors. This was intentional (a design decision), as I wanted a blended effect for this group rather than strong contrast (which would have shown the patterns much better). Next up — a series of three Valentine’s scarves in silk noil and tencel. Bright red. Hearts. I have the warp ready, and will begin putting it on the loom tomorrow. Ready to go “awwwwww”?